The FDC crew is filling sandbags and enjoying a smoke. The group includes Lt. Miller, the only FDC officer I remember doing this work. Filling sandbags was a daily job and could easily occupy six or more hours a day during the early stages of constructing a fire base. 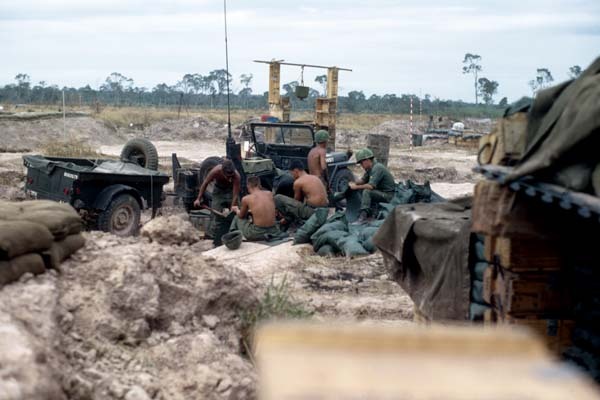 The man sitting on the sandbags is wearing stateside clothing, indicating he is newly arrived in Vietnam, a FNG. The heavyweight material of stateside uniforms retained water and was slow to dry compared with our jungle fatigues. This is FSB Washington II; the closest to the Cambodian border that our battery constructed until we built FSB Crook. At Crook we sustained several major ground attacks . The NVA unit arrived via the new extension of the Ho Chi Minh trail into Tay Ninh province and rapidly tested their ability to fight us. Washington II was abandoned and destroyed by us after intelligence reports indicated large numbers of NVA soldiers arriving. As we left Washington II we detonated in excess of 400 105mm rounds and many barrels of petroleum products. The explosion created a red glow in the night sky and wind that broke trees for perhaps a hundred yards. A bunker not completely destroyed in this blast provided a home for an enemy recoilless rifle. Recoilless rounds fired from that bunker resulted in severe injuries to Jack Sweitzer and Tom McMullen at FSB Crook on June 19, 1969.